ROSHARON, Texas—It’s 2:15 on a Thursday afternoon, and Butch Green is trying to figure out the correct pipe fitting for a prefabricated shower. That’s not in Green’s job description for Cooperative Baptist Fellowship field personnel. But it aligns with Green’s heart, which propels him to serve people who have endured some of life’s harshest blows. On this day, Green huddles with Peter Sar, a farmer, and Dale Feeler, a volunteer from First Baptist Church in Jefferson City, Mo. They’re standing in Sar’s home in rural Rosharon, about halfway between Houston and the Gulf Coast. Hurricane Harvey flooded Sar’s entire neighborhood of Cambodian refugees. Solving construction problems is all in a day’s work—at least for the time being—for Green. After Harvey hit, he relinquished most of his day job to coordinate CBF disaster recovery in Southeast Texas. So now, he keeps tabs on homeowners’ and churches’ needs and handles logistics for volunteer recovery teams. Sometimes, he ponders a plumbing riddle. From the road, Rosharon and most of the Houston area look normal. Floodwaters receded, leaving the landscape lush and green. But inside, flooded-out homes reveal a different story. Meanwhile, local CBF congregations, platoons of volunteers from churches elsewhere and CBF personnel are helping homeowners whose insurance and FEMA support aren’t enough to stabilize them again. A cloud crosses Green’s face as he thinks about what lies ahead. “I’m concerned, because (volunteer) groups are trailing off,” he says. Three will arrive before Thanksgiving, but none are set for December. One team will work in January, and two each are scheduled for spring break and next summer. Green expresses confidence other CBF groups will make plans to help the region recover, but he hopes they’ll step up sooner rather than later. “This is the optimal time for hanging sheetrock,” he says, noting many homes are ready to be refurbished. But he needs volunteers ready to put homes and lives back together. Specialists are in demand, too. “We always can use plumbers and electricians,” he notes. Green’s flexibility—willingness to let go of ongoing ministries in order to facilitate something historically urgent—reflects the versatility that has marked the career he and his wife, Nell, have embraced across three decades and three continents. They began in France in 1986 and a year later moved to Senegal, West Africa, where they served seven years. The Greens joined CBF in 1994 and worked with Touching Miami With Love, which grew out of the Fellowship’s response to Hurricane Andrew. Then they trekked back to Europe, to Belgium, where they worked with Muslims from North Africa. Next, they returned to the United States and settled in South Carolina, teaching Christians how to relate to Muslims. A transfer to Canada fell through, and they worked in Baltimore for about six months, wondering where they should serve next. That proved to be Houston, an assignment that brought them home to Texas in February 2011. Butch lived in Houston through the sixth grade and graduated from high school in Van. Nell grew up in South Louisiana but moved to Texas and graduated from high school in Madisonville. Across the past seven years, the Greens have helped resettle refugees, who have flooded into Houston faster than to any other U.S. city; worked with international students; sponsored interfaith dialogues with Muslims, who worship in about 100 mosques in the area; and combated human trafficking, a major scourge in the region. Their initial response to Hurricane Harvey mirrored their ongoing ministries. On Friday night, Aug. 25, Nell maintained ongoing text contact with a co-worker from Afghanistan whose family of six watched in horror as floodwaters rose up to their second-floor apartment. Then they spoke on the phone with a friend, a former international student who earned her Ph.D. from the University of Houston and who was communicating with seven other international students who had crawled into an attic before climbing onto their roof and swimming to safety. Even later, they received a call from a partner in their trafficking ministry about a stranded client who seemed to be going into labor. Nell is a nurse, and just before the Greens headed into the storm, the young woman’s labor stopped. And the Greens put feet to those prayers by facilitating CBF recovery efforts in and around Houston. Butch is hands-on, coordinating work sites. Nell keeps communication moving through social media. Rural Rosharon, home to the Cambodian refugee farmers. South Houston, where many of Houston’s Hispanic residents live and where Templo Bautista de Houston has been a hub of work. The Fifth Ward, an African-American community in the northeastern quadrant of the city, where Pleasant Hill Baptist Church and the Fifth Ward Community Redevelopment Corporation are providing energy and stability. For his part, Green has found joy in his newfound on-demand ministry. 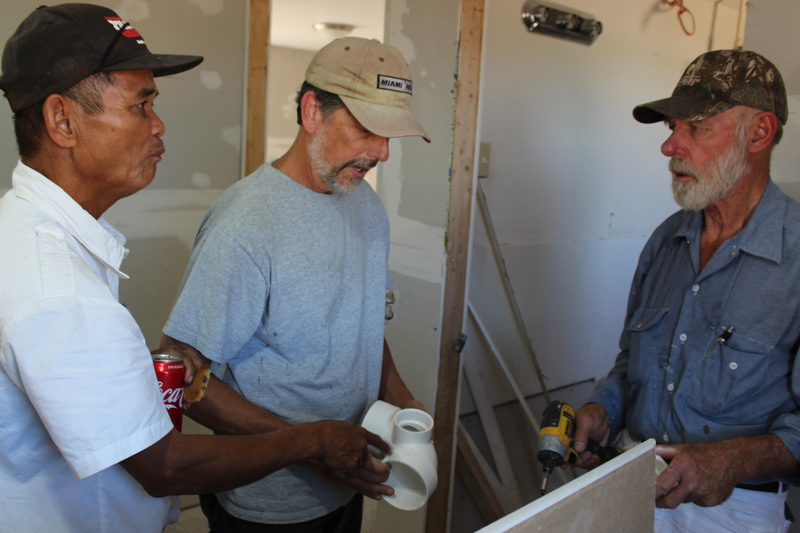 “It’s a blessing to see volunteers come and be what we’re supposed to be—the church helping people in need,” he explains. “We’re doing what CBF is all about—helping the marginalized, those who need help the most. Tags: disaster response, Hurricane Harvey. Bookmark the permalink.